63"Long, strong and heavy duty, this rolling rack is great for stockrooms, wedding garments, sales. Height adjusts from 66" up to 80''H. Rolls easily on 4'' industrial casters with brakes. Uprights and hang bar are chrome finish, base is painted OSHA ''safety-orange''. Weight Capacity: 300-400+ lbs. Racks can nest together for easy storage when not in use. Color: chrome with orange base. Heavy duty Z rack with optional adjustable hangrail. Double display space with this style garment rack. 80''H x 63''L. Rolls easily on 4'' industrial casters with brakes. Uprights and hang bar are chrome finish, base is painted OSHA ''safety-orange''. Racks can nest together for easy storage when not in use. Color: chrome with orange base. 63"Long, strong and heavy duty,this rolling rack is great for stockrooms, wedding garments, sales. Height adjusts from 66" up to 80''H. Rolls easily on 4'' industrial casters with brakes. Uprights and hang bar are chrome finish. Weight Capacity: 300-400+ lbs. Racks can nest together for easy storage when not in use. Color: chrome with black base. Heavy duty Z rack with optional adjustable hangrail. Double display space with this style garment rack. 80''H x 63''L. Rolls easily on 4'' industrial casters with brakes. Uprights and hang bar are chrome finish. Racks can nest together for easy storage when not in use. Color: chrome with black base. Compact version of popular z-rack 41"Long, strong and heavy duty, this rolling rack is great for re-stocking, sales. Height adjusts from 47" up to 70''H. Uprights and hang bar are chrome finish. Racks can nest together for easy storage when not in use. Color: chrome with black base. Light weight clothing z-rack cover, stitched to last. Provides clothes dust, dirt protection, zipper allows easy access. Color: clear plastic. Size: 69.5"H x 63.50"L x 22.5"D.
Top shelf screws to the uprights of heavy duty Z racks, provides additional storage for belts, handbags, folded clothing. Work with RZ & RZA, 55"long x 18"wide. Color: chrome. 4'long clothing salesman's rack is for everyday usage, stockrooms, overflow, seasonal and sales. Adjusts in height at 55", 60", and 65", 48" between uprights plus a 12" pull-out extension on each end. Includes 4'' industrial casters. Weight Capacity: 250 lbs. Folds flat for storage or transport, no tools required. Color: chrome. The salesman rolling rack with six feet of hanging space is the most popular rack. Each hangrail individually adjusts from 48" to 64", includes 4" heavy-duty rubber wheels. Both hangrails are 48" long and include 12" pull-out extensions on each end, of each rail, 20" spacing between two rails. Weight Capacity: 200 lbs. Folds flat for storage or transport, no tools required. Color: chrome. Heavy duty Z rack with optional adjustable hangrail, bottom shelf. Double display space with this style garment rack. 66''H x 63''L. Color: chrome, orange base. Heavy duty Z rack with optional bottom shelf. 66''H x 63''L. Color: chrome, orange base. Heavy duty Z rack with optional bottom shelf, black color. 66''H x 63''L. Color: chrome, black base. Clothing salesman's rack with removable middle hangrail is for everyday usage, stockrooms, overflow, seasonal and sales. Adjusts in height at 55", 60", and 65", 48" between uprights plus a 12" pull-out extension on each end. Includes 4'' industrial casters. Folds flat for storage or transport, no tools required. Color: chrome. Extend height of collapsible racks with set of 6" pole extensions. Work with RCOL-1 & RCOL-2, RSH. Simply slide into existing uprights. Sold in sets of 2 pieces. Color: chrome. Extend height of heavy duty Z racks with set of 10" pole extensions. Work with RZ & RZA, Simply slide into existing uprights. Sold in sets of 2 pieces. Color: chrome. 4'long clothing salesman's rack is for everyday usage, stockrooms, overflow, seasonal and sales. Adjusts in height at 55", 60", and 65", 48" between uprights plus a 12" pull-out extension on each end. Includes 4'' industrial casters. Weight Capacity: 250 lbs. Folds flat for storage or transport, no tools required. Color: black. Salesman screen attaches to collapsible single rack. Folds flat to fit on bottom of rack to use as storage shelf. Color: chrome. Medium weight collapsible rack 61"High x 21" deep x 39" Long. Adjusts in length from 39" to 61", top hangrail 39" long between uprights plus a 12" pull-out extension on each end. Folds flat for storage or transport, no tools required. Color: chrome. Our heavy-duty polished steel single bar rolling rack is perfect for stores, residences, and businesses of all kinds. Strongly constructed to hold your heaviest garments (up to 525 lbs), this versatile rack includes 3" heavy-duty wheels for easy transport and is designed to simply adjust in height from 60" to 80" at 8 height position adjustments, based upon the length of your garments. 60" long, 20" wide. Color: chrome. This 29-ball spiral garment rack displays over 2-dozen garments in eye-catching cascade. 61"'High, base with wheels. Color: satin nickel. 31"L x 18"D Floor rolling rack for belts, scarves and ties. Total 30 display hooks. Adjusts in height from 39" to 65". Each hangrail has 10 hooks and individually adjustable along the uprights. Includes casters. Color: chrome with black. This sturdy, attractive, versatile, collapsible round rack is a must for apparel sales. Adjustable legs from 48'' to 72'' in 3'' increments; 36'' diameter hangrail ring. Assembles & folds in seconds. Color: chrome. This sturdy, attractive, versatile, collapsible round rack is a must for apparel sales. Adjustable legs from 48'' to 72'' in 3'' increments; 42'' diameter hangrail ring. Assembles & folds in seconds. Color: chrome. Pegs to support round top for creating more selling and display space. Set of 4 pins to mount to round racks: RR36 and RR42. Color: chrome. 30'' diameter top wood shelf for round rack, made of melamine. Color: maple. 30'' diameter top wood shelf for round rack, made of melamine. Color: white. 30'' diameter top wood shelf for round rack, made of melamine. Color: black. Create more selling space with add-on hangrail ring for second level. 36'' diameter hangrail ring. Comes with 4 clamps to mount to rack. Color: chrome. Create more selling space with add-on hangrail ring for second level. 42'' diameter hangrail ring. Comes with 4 clamps to mount to rack. Color: chrome. This sturdy, attractive, versatile, collapsible round rack is a must for apparel sales. Adjustable legs from 48'' to 72'' in 3'' increments; 36'' diameter hangrail ring. Assembles & folds in seconds. Color: black. This sturdy, attractive, versatile, collapsible round rack is a must for apparel sales. Adjustable legs from 48'' to 72'' in 3'' increments; 42'' diameter hangrail ring. Assembles & folds in seconds. Color: black. 30'' diameter top basket with 3" lip mounts to any round rack to increase selling or display space. Color: chrome. 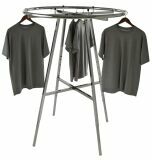 Adjustable height from 48'' to 72'' in 3'' increments; 42'' radius hangrail half ring clothing rack. Color: chrome. 2 way display rack with locking casters. Adjustable height from 48" to 72". 1 straight 16" arm, 1 slant arm with 8 balls. Color: grey. 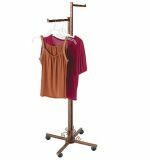 Decorative clothing rack with 4 adjustable arms allow you to accommodate a variety of garment lengths. Includes 3" casters. Arm adjust from 48'' to 72''. Color: grey. Decorative single hangrail rack with locking casters. Adjustable height from 49" to 66". Dimensions: 48"L X 20"D. Color: metallic sand. 3 way display clothing rack with casters. Adjustable height from 48" to 72". 1 straight 16" arm, 1 slant arm with 6 balls, 1 quarter round arm. Color: grey. This adjustable, double bar clothing rack is great for holding a lot of merchandise. Measures 60" long x 22" wide, with hangrails that individually adjust from 48" to 72". Tear-drop ends are made for use with extension rails. Color: black base/chrome hangrails. Double bar clothing rack is reinforced with metal braces for supporting even heavier weights. Measures 60" long x 22" wide, with hangrails that individually adjust from 48" to 72". Tear-drop ends are made for use with extension rails. Color: black base/chrome hangrails. 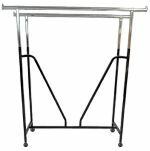 This adjustable, double bar clothing rack is great for holding a lot of merchandise. Heavy duty "Z" construction for heavier merchandise. Measures 60" long x 22" wide, with hangrails that individually adjust from 48" to 72". Tear-drop ends are made for use with extension rails. Color: chrome. This adjustable, double bar clothing rack is great for holding a lot of merchandise. Measures 60" long x 22" wide, with hangrails that individually adjust from 48" to 72". Tear-drop ends are made for use with extension rails. Color: chrome. 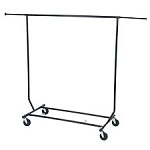 This adjustable, double bar clothing rack is great for holding a lot of merchandise. Heavy duty "V" construction for heavier merchandise. Measures 60" long x 22" wide, with hangrails that individually adjust from 48" to 72". Tear-drop ends are made for use with extension rails. Color: chrome. This adjustable, double bar clothing rack is great for holding a lot of merchandise. Heavy duty "Z" construction for heavier merchandise. Measures 60" long x 22" wide, with hangrails that individually adjust from 48" to 72". Optional hangrails for double tiering. Color: chrome. Create two-tier hanging of garments on any double bar H-rack with these add-on hangrails. Each hangrail is 60" long, complete with mounting hardware and tear-drop end caps. Sold in pairs only. Color: chrome. Turn two double bar racks into three (or more) with 60 long extension rails. Teardrop ends allow to create 15' of continuous hangrails to sell and show more. Sold in pairs only. Color: chrome. Half circle hangrail mounts to hangrails to creat endcap for more displaying space. Attaches only to teardrop endcaps of hangrails. Works only with RH, RHZBR, RHVBR. Color: chrome. 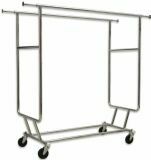 Display garment rack with 2 adjustable arms has heavy-duty "X" style base with non-locking casters. Arms are independently adjustable every 3" from 48" to 72". Colors: chrome; black. This clothing rack presents your garments face-out to show at their best from 4-directions. Individual adjustable arms allow you to accommodate a variety of garment lengths. Each push-button arm extends from 48'' to 72''. Color: chrome. Presents your garments face-out to show at their best from 4-directions. Individual adjustable arms allow you to accommodate a variety of garment lengths. Each push-button arm extends from 48'' to 72''. Color: chrome. This purse rack is perfect for hand bags, umbrellas or any merchandise with straps. Individual adjustable waterfall arms let you accommodate up to 5 bags with an easy access to any of them. Holds 40 handbags total. Each push-button arm extends from 48'' to 72'' in 3" increments. Color: chrome. This clothing rack presents your garments face-out to show at their best from 4-directions. Individual adjustable arms allow you to accommodate a variety of garment lengths. Each push-button arm extends from 48'' to 72''. Color: black finish. Floor freestanding purse display is perfect for hand bags, purses. Individual adjustable straight arms let you accommodate up to 5 bags with an easy access to any of them. Holds 40 handbags total. Each push-button arm extends from 48'' to 72'' in 3" increments. Color: chrome. Floor free standing purse display is perfect for handbags, purses. Individual adjustable straight arms. Rectangular tubing arms have a more upscale look. Holds 40 handbags total. Each push-button arm extends from 48'' to 72'' in 3" increments. Color: chrome. Presents your garments face-out to show at their best from 4-directions. Individual adjustable arms allow you to accommodate a variety of garment lengths. Each push-button arm extends from 48'' to 72''. Color: black finish. Decorative single hangrail rack with locking casters. Adjustable height from 49" to 67". Dimensions: 48"L X 20"D. Color: grey. Decorative double hangrail rack with locking casters. Adjustable height from 46" to 64". Dimensions: 48"L X 24"D. Color: grey. Decorative single hangrail rack with locking casters. Adjustable height from 49" to 67". Dimensions: 48"L X 20"D. Color: copper finish. Decorative double hangrail rack with locking casters. Adjustable height from 48" to 72". Dimensions: 48"L X 24"D. Color: copper finish. Decorative 2 way display rack with locking casters: 2 straight arms is a great addition to your store. Adjustable height from 48" to 72". Color: copper finish. Decorative 2 way display rack with locking casters: 2 slant arms is a great addition to your store. Adjustable height from 48" to 72". Color: copper finish. Decorative 3 way display rack with locking casters. Adjustable height from 48" to 72". 1 straight 16" arm, 1 slant arm with 8 balls, 1 quarter round arm 16". Color: copper finish. Decorative 4 straight arms display rack with locking casters, presents your garments face-out to show at their best from 4-directions. Individually adjustable arms extend from 48'' to 72''. Color: copper finish. Decorative 4 slant arms display rack with locking casters, presents your garments face-out to show at their best from 4-directions. Individually adjustable arms extend from 48'' to 72''. Color: copper finish. Revolving round rack is a must for apparel sales. Adjusts in height from 48'' to 66'' every 5"; 36'' diameter hangrail ring. Color: chrome. Decorative single hangrail rack with locking casters. Adjustable height from 49" to 67". Dimensions: 48"L X 20"D. Color: creamy pearl. Stylish rectangular tubing hangrail is 60" L. Rack adjusts in height from 49" to 72". 60" long X 22" deep. Color: raw steel. This sturdy, attractive, versatile, collapsible round rack is a must for apparel sales. Features include: push-button adjustable legs extend from 48'' to 66'; 36'' diameter hangrail ring; with wheels. Color: raw steel. Displays your clothes from 4 directions. Welds are darkened to add modern, sleek look. Stylish rectangular tubing 16" long arms are independently adjustable every 3" from 48" to 72". Includes locking casters. Color: raw steel. Displays your clothes from 4 directions, compact. Welds are darkened to add modern, sleek look. Stylish rectangular tubing 18" long arms are independently adjustable every 3" from 48" to 72". Includes locking casters. Color: raw steel. 2 straight 16" arms, 2 slant arm with balls. Adjustable height up to 75". Color: dark grey. 2 straight 13" arms. Adjustable height up to 75". Color: dark grey. Combination of 46" tall double sided metal frame with 22"D X 28"W wood base with casters. 1st side comes with 2 adj. arms; 2nd side - 3 adj. maple melamine shelves 12"D X 23.5"L. Arms adjust in height from 48" to 66". Color: grey finish with faux wood base. Rolling hat floor rack with 10 revolving tiers with 2 holders on each tier, 85"high X 26"wide. Ideal for hats, caps & wigs. Color: white. Rolling hat floor rack with 10 revolving tiers with 2 holders on each tier, 85"high X 26"wide. Ideal for hats, caps & wigs. Color: black. Make it easy to carry a collapsible rack with our bag. Designed for any collapsible rack (RCOL-1 or RCOL-2). Color: black. 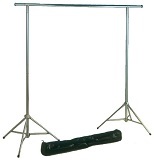 This medium weight clothing rack is great for traveling, tradeshows. 64" high, 60" between uprights plus a 12" pull-out extension on each end. Disassembles for storage or transport, carrying bag included. Color: chrome. Light weight clothing rack cover, made of nylon, stitched to last. Color: blue. Size: 60"L x 50"H.
Light weight clothing rack cover, made of nylon, stitched to last. Color: blue. Size: 60" x 72" x 24".